Numenware, a blog about neurotheology » Blog Archive » Did the Egyptians believe in an afterlife? Did the Egyptians believe in an afterlife? The King Tut Exhibition had its first stop in Los Angeles—and how could we possibly miss something like this? And of course one of the first things the exhibit taught was how the ancient Egyptians believed in an afterlife and that all the stuff they put in the tomb was designed to help young Tut navigate that afterlife more successfully: boats to take him across the equivalent of the Styx, assistants, tools such as knives, you name it. But what justification do we actually have in support of the concept that the Eqyptians believed in the afterlife? After all, there are many alternative explanations as to why they might have buried a king together with objects in this particular fashion. And parts of the theory are questionable. For instance, if the Egyptians had truly believed that their Pharaoh would be resurrected and enjoy an afterlife, why did they include models of objects instead of the real thing? Just as we were doing with Wanda, my strong sense is that the Egyptians were honoring King Tut’s memory and revisiting and modeling his life through the decorations in the tomb. This entry was posted on Sunday, January 16th, 2005 at 21:38	and is filed under history and culture. You can follow any responses to this entry through the RSS 2.0 feed. You can leave a response, or trackback from your own site. this is extremely unapropreate! I see some bad words happening here… so calm down everybody!!! i dont get it. FOGO!! this doesnt tell me anything about the after life!!! 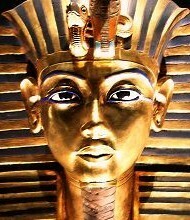 This believens of the after life from the Egyptians is very knowlageable. I’m taking my class to see the King Tut exibiht, and they are very excited. I’ll bet me and my class are ready to learn. We will be waiting to hear some exciting, and knowlagealbe facts! Speak like your a fucken Teacher? this makes it harder i need it for homework!